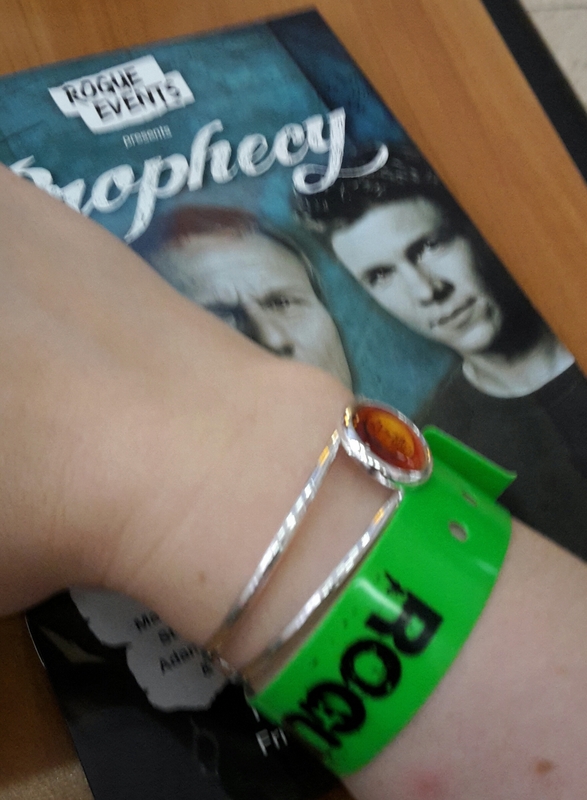 Prophecy was this past weekend – a three day convention for Buffy the Vampire Slayer and Angel, and my first convention by this organiser (Rouge Events) so I wasn’t sure what to expect. The main draw for me was meeting Alyson Hannigan but unfortunately she cancelled 3 weeks before the event. 🙁 I was gutted! As were many others who had purchased tickets to the convention. The company actually had three cancellations in the week’s leading up to the event. Not good, but, to their credit managed to replace all the guests before the convention meaning we had 8 in total. As this was my first Rouge Events convention, I wasn’t familiar with the set-up, but the venue itself was very familiar. It was held at The Hilton Metropole Hotel, making this my 9th(?) convention at this hotel! I like this hotel as a venue but it can be very expensive for food and drink, but once you know there’s easy access to the NEC and the train station (both short walks away) it makes bugetting easier. It took us three conventions at this hotel to realise that and we ended up paying the inflated prices for food and drink at the hotel itself (£8 for a small hot chocolate!). Now we enjoy more cost effective food either at the NEC or train station, there’s also a shuttle bus to the airport which has a Frankie and Benny’s as well as a Wetherspoons. We went to the former for my 23rd birthday which was at a Stargate convention. There’s also a new shopping centre (“mall”) near the hotel, opposite the Genting Arena with a small food court. The convention weekend started Friday evening with an opening ceremony and a themed party. We decided to skip this and arrived early Saturday morning, the theme of that party was favourite cult TV or movie character. Saturday started off at 6am and a drive up to Birmingham, the hotel allowed us early check-in to our room which was a bonus and we proceeded to the registration desk after unpacking. The registration process was quick and easy, the staff were really nice to speak with. We were expecting to be asked for ID to register (as indicated on the website), but no one asked us for this. Having got our lanyard, pass and wristband, we headed to the dealer’s room and ticket office to buy our extra autograph tickets as well as photo shoot tickets. Again, the staff were really nice to speak with and it was quick and easy to get the tickets we needed for the day. We missed the opening announcements but had good seats for the talk sessions once we got to the hall. The schedule for the morning consisted of photo shoots, stage talks / Q&A panels and “lounges” (you and approximately 20 people with the guest for a chat over coffee). We didn’t do one of the lounges at this event but have experienced them at past events for different organisers. We found it odd that these three activities ran along side each other so you had to pick and choose whether to hear a talk or go to a lounge (which usually run along side each other at other events) or choose to have your photo taken with the guests (at other events these usually run along side autograph sessions, which I think is a much better set-up. You don’t miss anything). I had two photo shoots booked so ended up missing parts of three talks with the guests, 🙁 which was disappointing for me as I love that part of the events. 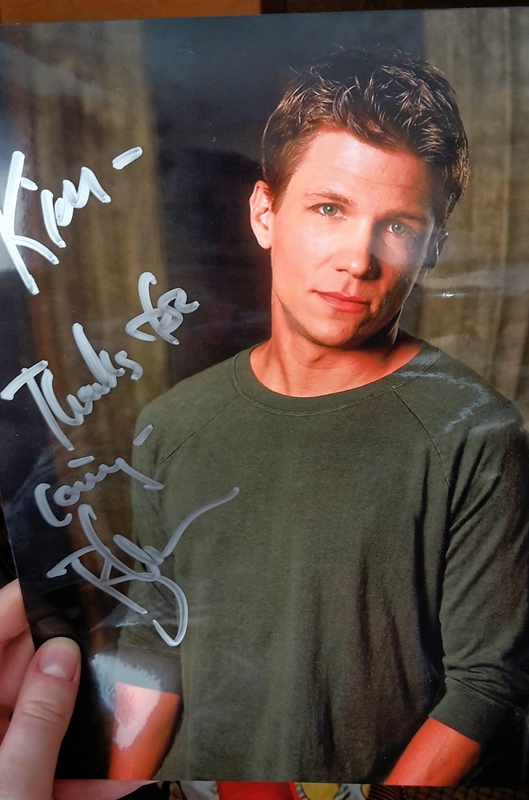 The two guests I had photo shoots with were Brody Hutzler (who plays Landock) and Marc Blucas (who plays Riley), both were in photo area 2 and the young lady who photographed us was very professional and I love the photos I got. Both guests were very friendly and engaging, took the time to say hello, asked how I was and were happy to pose for a “hug”. Marc also asked my name and if I was having a good day so far. The photoshoots were printed straight away so they could be signed later on, if you wanted, much better than needing to wait around for them to come back from printing. Which, in my experience, can take 2-3 hours plus! The talks were well run and you were able to go up to one of two microphones to ask questions. I didn’t, but did tweet Tom Lenk (who plays Andrew) a question which he answered later on. I don’t remember too much of the talks but one of the highlights was Anthony Head being requested to sing to us by one of the attendees and he sang some of “Sweet Transvestite” from The Rocky Horror Picture Show. He has a wonderful voice. I bought his preordered his album last year and he’s very talented. He had some copies of the CD for sale this weekend. The talk host was entertaining, passing the time between talks by telling us jokes. Bad jokes. The general response to his jokes were “groans”, haha. He was friendly and helped us out later that afternoon in the autograph session. But, before that happened there were some group photo shoots with the guests and a lunch break, which we spent exploring the new shopping centre and hotel grounds. 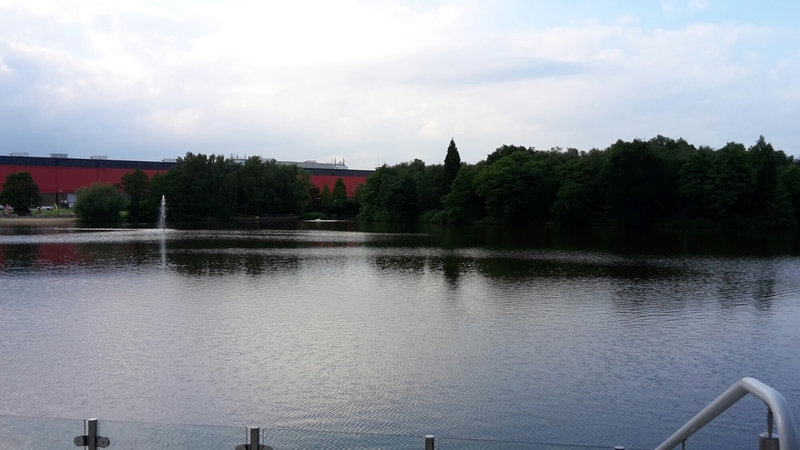 There’s a lake surrounding it and other areas. Saturday was the main signing day for our ticket group and we headed straight there once our group was called. The organisers used Twitter and screens in the talk hall to call groups to photo shoot and autograph sessions, we were in the dealer’s room at the time chatting to a good friend of ours, Will, who designs and makes journals and wall art, I have so much of his work and bought a Vampyre book replica this weekend that I got the guests to sign. 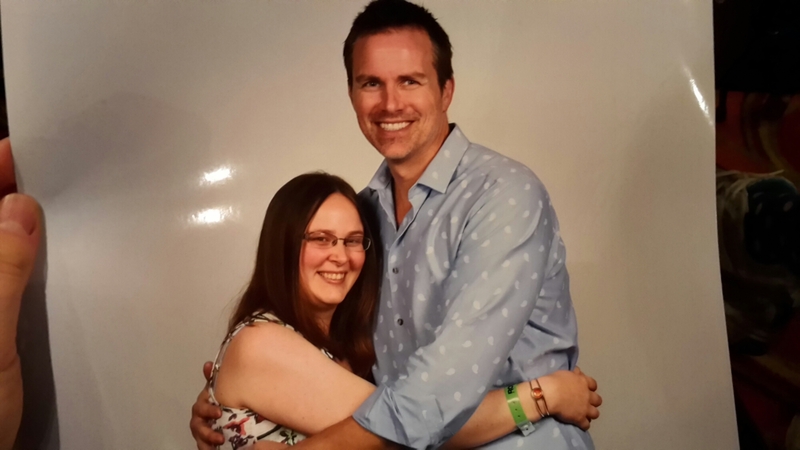 This was his first convention and he did not disappoint, he was very friendly and we had a little chat about the Vampyre book I was getting signed. He seemed genuinely impressed by it. I also had an 8×10 photo signed. Funnily he was wearing the actual shirt in this photo on the Sunday! My first time meeting him and he was really sweet, we had a chat, mostly about how the day was going and he signed a photo and my Vampyre book. During the weekend I was live tweeting, somewhat and Brody liked two of my tweets this weekend! The photo of us and the tweet I posted about being very happy with my autographs. The only female guest this weekend, Stephanie was bubbly and chatty. She definitely held her own with the male guests in all the stage talks. I’d met her before and she was just as nice back then as well. She signed my Vampyre book and we had a brief chat about the party that evening. She said she’d try and make it. While we were waiting to meet J August Richards, we were told that the autograph tickets we had for Anthony Head were the wrong type and we wouldn’t be able to use that to get his autograph. We had been given two £10 tickets but should have been given one £20 ticket with his name on. As J’s queue was very long, mum went to speak with the staff on the autograph desk about our issue and to try and fix it. She was told she’d need to go back to the sales desk as that’s were the tickets were purchased but they assured her that they could swap them for the right ones and she’d be allowed back in the hall and to rejoin me in the queue. It was sorted quickly and she rejoined me in J’s queue, even though one staff member tried to keep her from re-entering the hall! Fortunately the lady she originally spoke with was nearby and allowed her back in. Didn’t get the ladies name, unfortunately, but very thankful to her. I had a lot for J to sign and he was kind enough to sign all four items I’d brought him – two were from Agents of S.H.I.E.L.D (he plays Deathlok), one was an Angel dvd sleeve and the other was my Vampyre book. He was very impressed with the artwork of both my Vampyre book and the Agents of S.H.I.E.L.D book… Especially the Agents of S.H.I.E.L.D book. He personalised my Agents of S.H.I.E.L.D poster with his characters name. The signing session was a little rushed (by one staff member, not by Tom himself) as we were two of the last ones in the queue and he was due a break… Tom is very down to Earth and was writing witty quotes on everyone’s personalised photos, books etc. He wrote “Vam-py-res”, due to the front of the book, on mine. 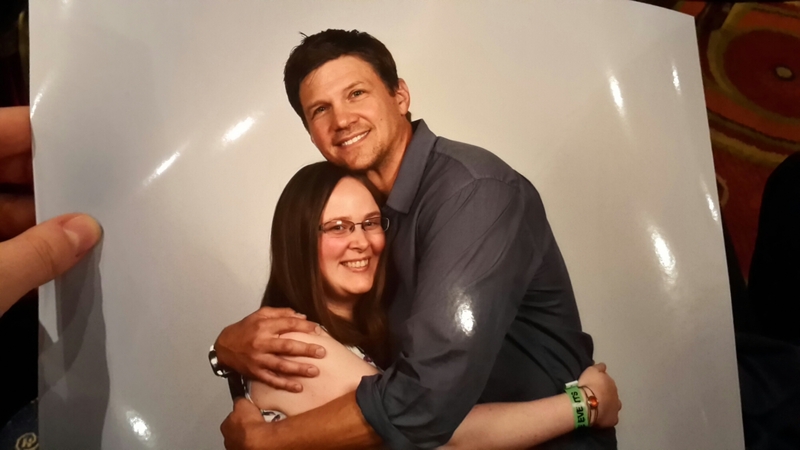 My second time meeting Adam, the first was at Hallowhedon 3 where he was there with Amber Benson. He’s as lovely as ever and seems more comfortable talking one on one or in small groups, like the lounges rather than the stage talks. I don’t blame him! 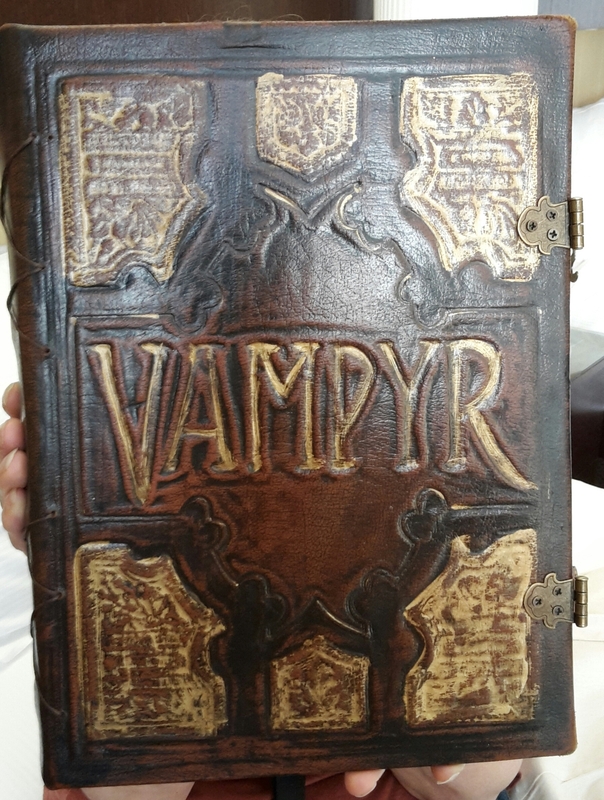 He asked questions about the Vampyre book I had with me and took a good look at it and flicked through the pages before signing it for me. Unfortunately I forgot to ask him where I could buy his CD (he is in a band called Common Rotation) or if he had any with him. 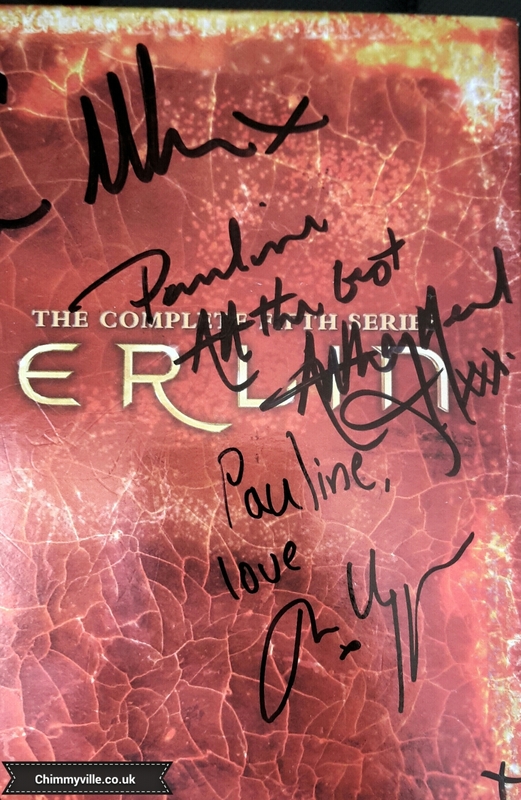 It was looking increasingly likely at this stage that we wouldn’t be able to get all our autographs, but the talk host I mentioned earlier was very helpful and ensured we got all our autographs. We were originally in Anthony Head’s queue but Mark Lutz’s seemed to be moving the quickest. The talk host (I wish I’d got his name!) suggested we join Mark’s queue and get his autograph first and that he’d allow us to rejoin Anthony’s queue afterwards, so that’s what we did. At the front of Mark’s queue we greeted him by saying how nice it was to meet him again and had a brief chat about Hallowhedon 1, which was held in 2009 and is where we first saw him. It sounded like that was his last Buffy convention he’d been to in the England (he mentioned a convention in Wales he’d attended), but not the last time he’d been over. He lost his train of thought signing my book and said we could say we were there when he lost his mind! Haha, he wrote “cheers 3 beers” and said it’s his new thing and that beer is good. We rejoined Anthony Head’s queue and were two of the last people to meet him that day, there was one girl behind us and Immy who I’d met online before but not in person, until now, was infront of us. When we got to Anthony we thanked him for staying on in the signing session, as it should have ended 10 minutes before we got to the front of his queue and he responded by apologising for keeping us waiting! We didn’t mind as it showed how he cares about his fans and was happy to chat with them. I had a couple of things for Anthony Head to sign, my Vampyre book, a script book and mum had a Merlin season 5 boxset signed. She proudly told him that he’s now signed all 5 of her Merlin box sets over the years, he said “wow” and chuckled. He was very impressed I “got Joss” (his words) on my Once More With Feeling script book, as well as Amber Benson’s autograph. He drew little music notes alongside his signature. He recognised the Vampyre book (with a little reminding) from earlier in the day as he had a photo shoot with it for Will. 🙂 He was very impressed with the book itself. Everyone was lovely to meet and chat with. Very happy with the autographs I got and happy they were all doing personalisations rather than only their signature on the image / memorabilia. Once we’d finished at the signing sessions it was time for some dinner before getting ready for the prom themed party at 9pm. For the party I wore a short black evening dress with detailing on the waist and mum wore a flower print maxi dress. We were a bit disappointed with the party as there weren’t too many songs being played that we could dance to and the majority of the songs were ones that had been in Buffy or Angel; don’t get me wrong, the soundtracks to both shows are great but not very good for dancing too. We did enjoy sitting and listening to them and catching up with our convention friends (shout out to Sarah, Gemma, Pia and Lou). The only let down about the party was the prices for drinks. I know that’s not something Rogue Events had any control over (they even arranged 20% discount for us all) but the two drinks we had cost nearly £11. Very expensive! Sunday was a lot quieter than Saturday, for us, as we had all our photo shoots and signings the day before. It did mean we were able to listen to all of the stage talks in full, which were all very funny and some very insightful. I was glad we got to listen to them all, unlike Saturday. However, once the talks were finished we had nothing to do until 4.30, besides packing. 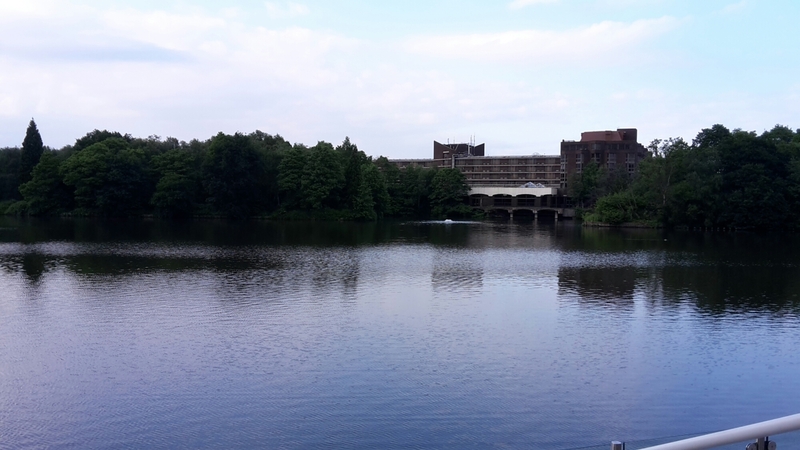 We went for a long walk around the grounds and the lake (again) and enjoyed our packed lunch and a Costa Coffee from the shopping centre before checking out of our hotel room and heading to the dealer’s room for the raffle draw. There were three raffles this weekend, two by the organisers for photo shoots, lounges etc and one by the dealer’s to win some merchandise. I came home with an Angel tv show poster. 🙂 We were impressed with the dealers room and took away some business cards for future purchases. The organisers were also selling autographs from some of their previous events for those that couldn’t make it which I thought was a nice idea but there seemed to be none for the event I was interesting in. Will helped me out and asked one of the staff if they could find out some autographs from that event so I could have a look. The event was City of Heroes, which was for fans of Arrow, The Flash and Gotham. 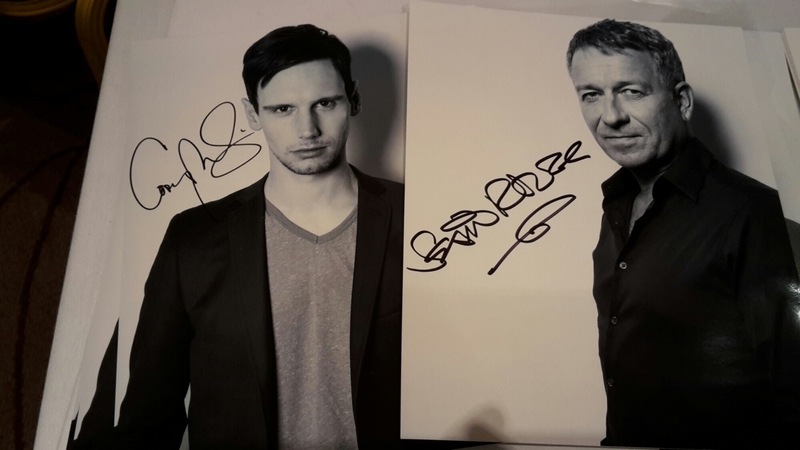 I ended up buying a couple of Gotham autographs. Yep, Batman related autographs at a Buffy and Angel convention. For down time between the panels and autograph sessions Rogue Events had put footage from old stage talks on the screens for attendees to watch. The one we saw was Amber Benson, Clare Kramer (who play Tara and Glory, both of whom I’ve met) and Elizabeth Anne Allen (who plays Amy). Having watched that stage talk, I really would like to meet Elizabeth one day, she seems really nice. At 4.30 the organisers put on a Once More With Feeling singalong for us all, which was fun and a nice touch. I was a bit disappointing that not many attendees were singing along. 🙁 Mum suggested it was because the words weren’t displayed on the screen (subtitles). Maybe. The last stage talk of the day was with all the guests and was followed by a brief thank you and goodbye from the staff to close the event. They also announced they’ll be holding Prophecy 2 in London next year (date: TBC) and it would be limited to 500 tickets. At the end of the last talk some of the guests took photos of the attendees from the stage and many attendees stood up and waved. The guests were all given a standing ovation to thank them for a great weekend. We started our journey home after that and ended up going 20mph through road works for a lot of the journey. I’d heard many horror stories about Rogue Events and was apprehensive about attending one of their conventions as a result. Although the scheduling didn’t make sense to me personally, I’m sure there are reasons why they do it, everything went smoothly and we got all the autographs and photo shoots we needed. Would we do another Rogue Events convention? Yes, depending on dates and location.